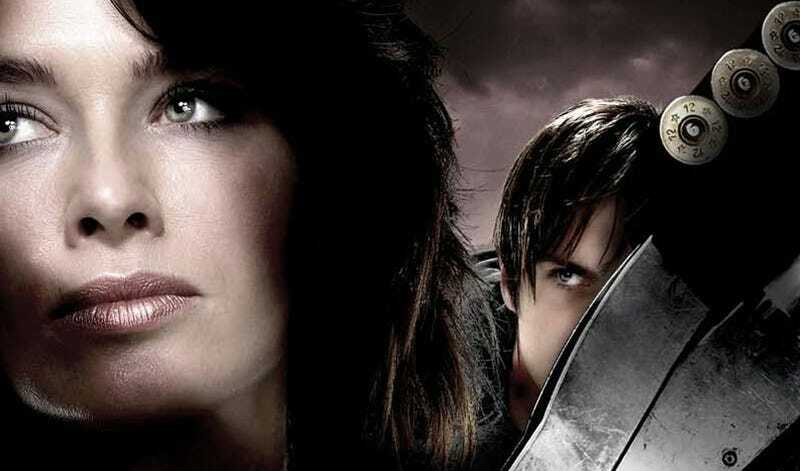 Earlier this week, Charlie Jane reviewed the latest episode of Fox's Terminator: The Sarah Connor Chronicles and wondered aloud why the show wasn't as popular as ABC's Lost. She came up with some possible reasons of her own, but missed out the essential one: It doesn't seem to want to be.I'll admit, I broke up with Terminator a few weeks into the second season. It wasn't painful, we just drifted apart, seeing other people, and before I knew it, I had three episodes on my TiVo and very little desire to watch them. That delete button was just so... tempting, goddammit. But looking at the suggestions Charlie came up with for why the show wasn't at Lost levels, some seem ridiculous ("Not enough alpha males"? Seriously? That "problem" hasn't affected the popularity of female-led shows like Gray's Anatomy, Desperate Housewives, The Closer or, for those looking for something a little closer to genre home, Buffy), but others were on the button - or remarkably close - to why I lost interest in the show... and, more than likely, why others never had interest in the first place. The central conceit of the show is too narrow. "We must stop the oncoming robot apocalypse, mostly by running away from and then destroying killer robots that are chasing us" is a great idea for a story and, as the Terminator movies have shown, can be very effective in the short term. But as the central idea behind a theoretically open-ended story like a television series, it's too little, too repetitive and ultimately boring - Setting up a cat and mouse game as the series tries to do, no matter how interesting, fails, because if neither side can ever score a definitive victory - and they can't, because one side winning ends the series, the way that it's set up - then the stories have no real impact and become meaningless. Charlie complained that "people think they know what it's about, because it's based on a movie franchise," and that's essentially true - but the real problem isn't with the audience's expectations based on the movies, but the fact that the show hasn't shown any desire to break with those basic expectations. (One thing that would bring me back to the show? Less Terminators, less Skynet. If the show expanded its horizons - like Buffy going beyond vampires, for example - then that would be unexpected enough to signal that the creators were looking to appeal to more people than just the fans of the movies.) There's no hook for the audience. I know, you're sitting there spluttering "Summer Glau being a cute little reformed killer robot trying to stop the oncoming robot apocalypse isn't enough of a hook?" (And, in my mind, doing so in a Simpsons' Comic Book Guy voice, just because), but that's not the hook that I'm talking about. Lost captured the attention of its audience by hooking them in with a series of questions about the show from the very first episode: What is the island? What's with the smoke monster? Why have they crashed? Will they get off the island? (Now, they almost lost that audience by not answering those questions for a long time, but that's another story.) Heroes went another route in trying to hook its audience, by coming up with "Save the cheerleader, save the world" - Essentially the same idea of changing the future as Terminator, but with a catchier explanation and, more importantly, a pay-off. It's not that Terminator doesn't have the potential to appeal to a Heroes or Lost-size audience, more that it doesn't seem to want to tell that audience about that potential, or make it easy for them to jump in. All of the characters are unlikable. I can't be alone in thinking that all of the characters on Terminator are assholes, right? It makes a lot of sense, storywise - They're all so driven by their missions and their destinies that they don't have anything resembling social skills or the ability/time to go beyond their immediate needs, which are generally "I must stop/assist the oncoming robot apocalypse" - but as a casual viewer, it's tiring and boring. It also highlights one of the real barriers that's keeping this show from breaking through to a larger audience: This isn't a character-led show. It's all about the plot, and the characters are all very clearly in service to the plot... which stops them from being not only relatable to a mass audience, but also stops them from being believable. Compare the show to, as Charlie did, Lost. While the island drama has as much of a plot-driven storyline that forces its characters to stay in near-constant "What is that smoke monster Oh God all the Others are going to kill us Is that a tanker Oh crap it's blowing up" anxiety, its characters still had time to find humor, romance, and other kinds of emotions in there as well (And the flashback device, as frustrating as it can be at times, allowed us to get to know the characters away from all that island anxiety, so that we cared about the ever-present danger even more as a result). Terminator doesn't do that kind of thing nearly enough. It's not like people haven't tried to like the show. To be brutally honest, Terminator: The Sarah Connor Chronicles is its own worst enemy. It's one thing to ask why the show doesn't have 12 million viewers, but the premiere episode had around 19 million, and they've just dropped off ever since. The problem isn't that people haven't given the show a chance; it's that the show hasn't given them enough reason to stick around. In a way, I think that Lost is a bad comparison for Terminator. While thinking about Charlie's question, and the show itself, I kept coming back to Battlestar Galactica. It may not seem like the most obvious choice (After all, more people watch Terminator than BSG, if only because more people watch Fox than SciFi in general), but it strikes me as the closest thing to Terminator out there: It's a spin-off of a familiar franchise that deals with apocalyptic themes and similarly driven characters - not to mention robots that look like humans and are out to kill us. But it does everything right: It gives us characters who we can relate to and believe in, who manage to behave like real people in between all the drama. It steps outside its central conceit to give us legal dramas and Iraq War metaphors and, yes, even annoying Starbuck-centric "I am an angel of light" moments. And it even manages to reinvent itself enough in a way that not only gives viewers a steady stream of new memes (Will they find Earth? Who will win the election Will they get off New Caprica? Who are the final five? Who is the final Cylon? What the frak happened to Earth? etc.) but also, most importantly, enough payoff to make those questions and hooks worthwhile. Why isn't Terminator: The Sarah Connor Chronicles the new Lost? Because it's an entirely different show with entirely different aims, I think. But I also think that it shouldn't try to be, really; instead, I'd much rather they looked at Battlestar Galactica a bit more closely and learned how they did it. If Terminator ever becomes as compelling as BSG, then the viewers will hear about it and come back, after all.